"Pre-School - Grade 2. "On a very dry day in Africa, one tortoise found a lonely waterhole." 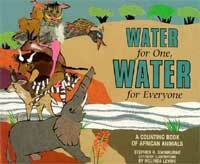 So begins this cumulative counting book that presents an array of animals as they come to quench their thirst. Finally, 10 elephants drink it dry. They then lift their trunks, trumpeting a message to the clouds and summoning the rain needed to refill the waterhole. An author's note gives the Swahili words for the animals and for numbers from one to ten (however, the numerals are not included). The cut-paper collages, done predominantly in earth tones, are finely textured, full of depth, and work well with the text - with one exception. The water is depicted as gray and white stripes that give the impression of mattress ticking, which may confuse children. The story is simple and pleasingly repetitive. This book is competently done, but breaks no new ground.